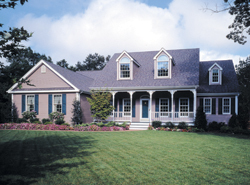 Country house designs are characterized by a welcoming front porch, second floor dormers, and symmetrical windows. Combining elements from several American home styles, country homes began showing up throughout the South during the 18th and 19th centuries. The front porch is the focal point along with symmetrical windows accentuating the exterior. Dormers, brought back from Colonial style homes, also contribute to plenty of interior light, as well as increasing the living area. Even with its simplicity of design, Country dwellings are an elegant fixture in America’s landscape, seen today in all areas of the nation. Country style floor plans deliver a relaxing, laid-back lifestyle often associated with rural homes regardless of where you end up building your home. Browse our country style homes and compare plans to determine the best design for you and your family. With a huge selection to choose from, we know you will find the perfect country floor plan to fit your needs and lifestyle.